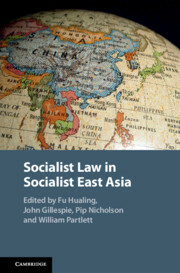 "Socialist Law in Socialist East Asia"
Introduction: More than fifty years ago, socialist states in Asia turned to the Soviet Bloc for inspiration in developing their political and legal systems. They enacted constitutions and laws, and established institutions that, with varying degrees of faithfulness, replicated Soviet regulatory models. The collapse of socialism in the Soviet Bloc was accompanied by the literal collapse of structures and bodies previously considered indestructible, such as the Berlin Wall and statues venerating social heroes. Mirroring this decline, much subsequent analysis about socialist Asia promptly devalued and dismissed social institutions, legal theories and forms of knowledge - presupposing a linear transition from socialism to liberal legalism. Far from linear, legal reform in this region has been variegated and complex - raising the question of whether socialist laws and institutions were more resilient and adaptable than previously thought. This book argues that the scholarly focus on the emergence of liberal legalism has marginalized the ongoing normative and structural legacy of Asian socialism found in various guises in contemporary Vietnam and China. The assumption of the inevitable export of Western capitalism, together with versions of liberalism and its institutional manifestations, is, we suggest, flawed, or at least misconceived, in socialist Asia. The chapters suggest that, at lease in part, a failure to recognize the normative and structural legacy of Marxist-Leninist approaches to socialism constrains our capacity to interpret the contemporary Vietnamese and Chinese reforms. Further and significantly, a failure to recognize the socialist legacy risks overlooking a key reason for ongoing local support for strong/authoritarian states in socialist Asia, which seek to promote 'development' while also resisting its destabilizing effects. As will become evident, the impacts of contemporary socialism vary across countries, jurisdictions and institutions.